Colorado-based Vail Resorts has joined the ranks of small companies as well. It inked a 12-year agreement to buy new wind that will be produced from a Nebraska farm starting in 2020. When the wind farm is operational, the purchased power will offset Vail’s fossil fuel use across North America. “This is the way that a company that’s geographically diverse can make a significant impact and bring new renewable resources online,” said Kate Wilson, director of sustainability for Vail Resorts. Read more here. Lincoln Clean Energy photo of the partially-completed 230 MW Plum Creek Wind Farm in Wayne County, Nebraska. Once operational, the project will create high-paying local jobs and will result in over $3 million in local community benefits annually in the Wayne County area. This includes much needed property tax revenues, with some of the largest beneficiaries being the Norfolk and Winside school districts. 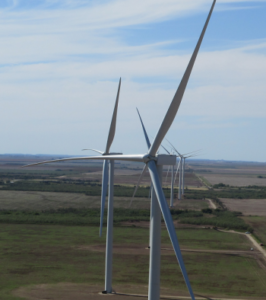 The company’s multimillion-dollar wind energy virtual power purchase agreement enables the development of the Plum Creek Wind Project. It is expected to generate enough renewable energy to power up to 100,000 U.S. homes each year. The wind farm will have a capacity of nearly 300 megawatts. North Dakota currently has about 3,150 megawatts of wind capacity. With more than 5 GW of approved solar projects in the ERCOT grid, Texas is getting ready for a major boom in its utility-scale solar market. This entry was posted in Nebraska / Midwest News, NewsBlog and tagged 100% renewable energy news, corporate renewable energy purchasing, EV charging infrastructure, Illinois' Future Energy Jobs Act, Illinois' Path to 100 Proposal, Kaiser Permanente, Minnesota Bill HF700, Nebraskans for Solar NewsBlog, Plum Creek Wind Project, Rocky Mountain Institute, Vail Resorts Corporation, wind energy development in Nebraska on February 12, 2019 by Helen Deffenbacher.